Summery : As Cody numbly searches for answers as to why Meg took her own life, she begins a journey of self-discovery which takes her to a terrifying precipice, and forces her to question not only her relationship with the Meg she thought she knew, but her own understanding of life, love, death and forgiveness. Gayle Forman is one of my absolute favourite YA contemporary authors, she manages to make her simple stories so captivating with her characters. I had the chance to meet her and listen to her talk about her books for about an hour and she herself is a very interesting lady with some incredible ideas. When I dived in to her latest release of I Was Here I was more than excited, having just read If I Stay and Where She Went and adored them! I Was Here is a novel based around a young girl who commits suicide with the help of an online community. When her best friend Cody finds out about these so called ‘friends’ which helped Meg drink a whole bottle of industrial strength cleaner, she makes it her goal to find out what actually happened to Meg. The book follows Cody’s search for the truth behind her best friend’s dark past she knew very little about. Before I started I Was Here I was already completely in love with Gayle Forman’s stories. I found If I Stay and especially Where She Went so captivating that I could not wait to dive in to the next story! I Was Here was one of the first books that I’ve read about teenage suicide. I’ve stayed away from that topic for numerous reason in the past and have only just started to develop and interest in reading about it in novels. Since reading I Was Here I’ve read Looking for Alaska by John Green, The Rest of Us Just Live Here by Patrick Ness and a few more YA depression novels and I must say that Forman handled the topic incredibly well. The whole sense of the book didn’t feel like children with irrational problems like some others do. It felt real and powerful and I just thought it was handled brilliantly for a younger audience. I especially enjoyed the characters in I Was Here. 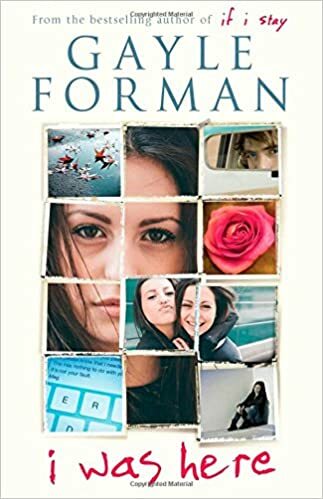 It seems like every Forman novel has some kind of girl who’s a little different, a boy in a band and some very unconventional best friends. This was absolutely no different. Her characters always feel very safe and warming and it puts you in a good mood to read about them. Although the main points of the book were about Meg and Cody’s friendship, what’s a YA novel without a little romance? Forman ALWAYS writes romance tastefully in difficult situations. Whereas I found that this story wasn’t as unique as If I Stay, I found it just as entertaining. All of her stories have a few twists that you never really expect and they leave you surprised at the end. Once again, Forman managed to write a tragically sad yet beautiful novel about the power of friendship. She always creates quick reads that leave you wanting to read a hell of a lot more about the characters and that is the sign of an incredible writer! She leaves you completely gripped by the end.